Season 5 of the Mid-States Poker Tour began with a final table in Minnesota reached by Peixin Liu. 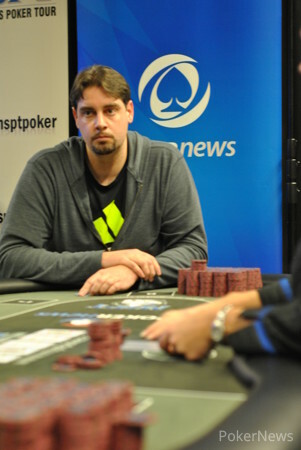 There, he busted fourth in a tournament ultimately won by fellow Minnesotan Mark Sandness. The tour returned to its home state for the last stop of the season, and this time Liu finished on top. 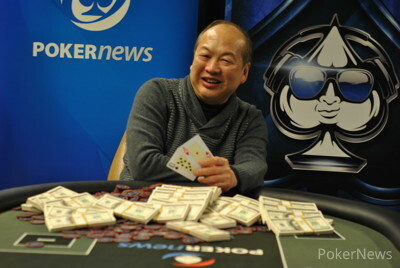 He claimed $106,483 for defeating a field of 432 at MSPT Canterbury Park, the biggest live score of Liu's poker career. Ninety-three runners returned for Day 2 to compete for the final MSPT trophy of the year, and 45 would be paid for their efforts. Plenty of notables failed to reach the bubble, including Todd Breyfogle, Jon Hanner, Tony Hartmann, Matt Alexander, Adam Dahlin, Jeremy Dresch, and Kou Vang. By falling before the money, Vang fell just shy of the necessary points needed to overtake Mike Deis for MSPT Player of the Year. The bubble burst in spectacular fashion when tournament veteran Everett Carlton bluffed off his stack to Day 1 chip leader Rodney Colson, jamming the river on an board with . Colson took tank-called with . Colson, who was at one point the overwhelming leader in the early stages of Day 2, found himself out in 10th when he lost a race with to Liu's . Zeph Baer, Rich Alsup, Mark Hodge, and John Pierce followed in short order in ninth through sixth respectively in a furious opening hour at the final table. Liu had emerged as the leader at that point with 2.5 million at the start of Level 28 (30,000/60,000/10,000). Minakrin was the short stack, but he won a flip with against the of Leo Fussy, rendering Fussy short, and he busted a short time later in fifth. Things finally slowed down four-handed, as it took an hour and a half of battling over mostly small pots before Minakrin fell in fourth. He called off his last 14 big blinds with against a small blind shove from James Wilson, who had and held. Wilson did the deed once more to send John Reading packing in third. After a flop, Wilson put Reading at risk for 1.7 million, more than the pot, during Level 30 (50,000/100,000/10,000). Reading called off with and couldn't hold against Wilson's as the latter hit a flush. Liu and Wilson entered heads-up play very close to even, and they battled it out for an hour with Liu gaining the upper hand when he called Wilson's four-bet shove with and was against . 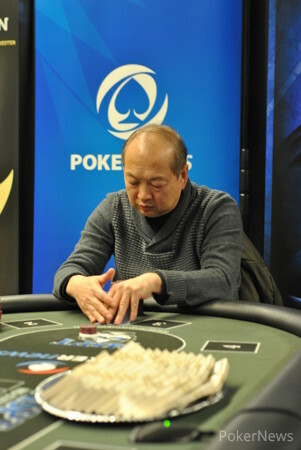 An flop left Liu drawing thin to stay alive, but a turn was what he needed to grab the chip lead. Liu got two streets of value with a short time later to increase his lead, and a flop proved to be the final one of the year for the tour. Wilson shoved in with , and Liu called with , holding when running hit the board. With that, the 2014 MSPT season came to a close, crowning Liu as the final champion. The MSPT is done for the year, but Season 6 is coming up quick. It will kick off at a brand new stop — BestBet Jacksonville — on January 15, 2015, with their $200,000 guarantee Main Event taking place from Jan. 23-25. For more information visit msptpoker.com. On a flop, James Wilson pushed all in for about 2 million and was called by Peixin Liu, who held . Wilson had for middle pair, and he needed help, but running didn't do it. James Wilson raised to 260,000 on the button, and Peixin Liu made it 520,000. Wilson called, and the two saw flop. Both checked, and Liu bet 400,000 on the turn. Wilson called, and a hit. Liu bet 600,000 this time, causing Wilson to pause at length. After a minute or so, he called. Liu showed , and it was good. James Wilson raised to 260,000 on the button, and Peixin Liu made it 500,000. Wilson pushed all in, putting Liu at risk for 2.84 million, and the latter called. The door card was the , followed by . "Ah, on the flop," Liu said with disgust. He was considerably happier on the turn, which gave him a lock winner with a set. Peixin Liu raised to 250,000 and was called by James Wilson. Wilson bet 250,000 on the flop and Liu called. Wilson checked the turn, and it was his turn to call after Liu bet 200,000. The completed the board, and both players checked, Liu turning over . "I thought you were going to bet," Wilson said, showing . James Wilson raised to 200,000, and Peixin Liu called. Both checked the flop, and Liu checked the turn. Wilson bet 400,000, and Liu called. On the river, Liu led out 200,000, and Wilson immediately called. Liu tossed in for a missed straight draw, and Wilson had for a pair of eights. Peixin Liu and James Wilson play heads up.